The Catholic Church went out of business when its hierarchy ceased to believe its own dogma. Leo X didn’t take Luther’s thought as a serious matter. He didn’t expect others to do so. If the misuse of money was seen by the church as the major threat to the social unity of Christendom, imagine the despair of the faithful when the Pope himself resorted to financial chicanery to finance the renovation of St Peter’s Basilica in Rome. The banker known as Jakob Fugger the Rich was chosen by Pope Leo X to manage the money-raising campaign. Johanne Tetzel, a Dominican priest,began the sale of indulgences across the German lands. In particular, Albert,the Archbishop of Maintz, agreed to allow the sale of the indulgences in his territory in exchange for a cut of the proceeds. He did so in order to pay off the debts he had incurred in paying for his high church rank. Despairing of the money corruption and usury-driven indulgences, Martin Luther (pictured above) famously nailed his ninety five theses to the door of Wittenberg cathedral. Within two weeks, copies of the Theses had spread throughout Germany; within two months throughout Europe. Though more and more commonplace in the late Medieval period, usury was still considered a sin and one most closely associated with the Jews. So when in 1520 Luther wrote in his letter To the Christian Nobility of the Christian Nations,‘Fugger and similar people really need to be kept in check’, he was speaking against the usurious activities of bankers and Jews, with convictions that were consistent with those that had driven in the nails at Wittenberg three years earlier. Luther’s intention had been to cleanse the church of its money corruption and return it to a simple theology of the cross. Unintentionally, he had unleashed the forces of the Reformation, the reverberations of which can still be felt in our own times. It is possible to imagine a Luther without Calvin, but impossible to imagine a Calvin without a Luther. Nevertheless, once Luther had opened the doors to reform, Calvin rushed in to rearrange the ecclesiastical furniture. In his fear of the sacrilegious and socially corrupting power of money, Luther was socially conservative, whereas the second generation reformer, John Calvin, was a force for radicalism. Calvin assumed an economic organisation that was relatively advanced as far as the power of money was concerned, and expounded a social ethics on the basis of the seemingly inevitable future. Thus Calvin stood in marked contrast to Luther and the medieval theologians who proceeded him. The medieval church had striven to keep the uses of money limited and under strict control, with usury in the most widely defined sense outlawed as an excommunicable offence. Society was conceived holistically as a people of God, which reflected St Paul’s metaphor of the Church as the body of Christ. In this social organism the parts, though varied, each served vital functions for the survival of the whole. Disproportionate growth of any one part, such as trade for monetary gain, was seen as a malignant threat to the rest, quite apart from the biblical admonishment of usury as sinful. Calvinism, an urban movement, found its stronghold in social groups to which the traditional scheme of social ethics had become irrelevant. Its most influential adherents operated in the great business centres like Antwerp with its industrial hinterland, London and Amsterdam, strongly influenced by generations of Jewish emigres whose antecedents had been ousted from Spain, England and France. For any reformed theology to thrive in these conditions, it had to start from a frank recognition of the necessity of capital, credit and banking; and that is just what Calvinism did, breaking with the tradition that regarded a preoccupation with economic interests beyond subsistence needs as sinful, stigmatising the middleman as a parasite and the usurer as a thief. Under the new and progressive urban conditions, the rules were turned upon their head. Whereas to strive for personal enrichment had once seemed incomprehensible, for the Calvinist there was nothing wrong with good honest profit, as he understood it, derived from diligence and industry. Usury became respectable, where it has previously been condemned as immoral. Calvin and his followers assumed credit to be a normal fact of life; and the financier was not a pariah, but a useful member of society. Luther believed that anyone could reach salvation as long as he had faith. This belief is shown in his famous statement ‘justification by faith’. One did not have to be chosen to have faith. In contrast, Calvin preached that those predestined for salvation were defined by their virtuous lives, and they were referred to as "the elect." Also, the elect could be determined by their economic and material success. Under this doctrine, good works, whilst not a way of attaining salvation, become indispensable as a proof that salvation has been attained. The aptitudes cultivated by a life devoted to business found their complement in the new theology, which formed the basis of a new paideuma, a term coined by Leo Frobenius and described by Ezra Pound as meaning ‘the tangle or complex of the inrooted ideas of any period. . . ,the gristly roots of ideas that are in action’. In this reformation paideuma of the Calvinists, the will of God was allied with the economic virtues that has escaped the clutches of the restrictive traditional belief system of the Medieval Roman church. The escapees and inverters of the values of tradition from this point would see all forms of traditional belief as barriers in the path of progress; and it would be a linear path into the future, in keeping with Judaic tradition. Calvin’s emphasis on Sola Scriptura, meaning the Scriptures as Christ’s unique revelation of the way to life, threw a greater emphasis upon the Old Testament for the individual Christian than under the Roman Catholic tradition. With the stories from the Hebrew Bible as their example, all opposition from tradition along the path ahead would be dealt with as ruthlessly as Joshua dealt with Jericho etc. In their determination to clear the pathway ahead, the adherents of the new paideuma would use every weapon at their disposal, including subterfuge, political revolution and war, because the issue at stake was not merely economic self-interest, but now the will of God, later to be the will of the people. By1571 in England, a mere thirty years after the suppression of the monasteries, the Act of 1552, which had prohibited all interest as ‘a vyce moste odyous and detestable, as in dyvers places of the hollie Scripture it is evident to be seen’*, had been swept away. This was but the outward expression of the new paideuma**, a view which held that the world of money and commerce existed in an amoral sphere of their own, separate and apart from religion and ethics. Religious belief would become increasingly a private affair, whilst the ‘freedom’ of the market reflected the struggle amongst the various possessors of wealth for supremacy. Everything would have its price in this blind battle of everyone against everyone. Everything would eventually be bought and sold. Nothing would escape the meshes of this devil’s mill. Gone was the concept of society as a social organism in which everyone had his or her diverse, but equally important, part to play. Society would now consist of the elect and unelect, winners and losers, the chosen andthe rest, in a civil society that grew out of Calvin’s covenantal or contractual view of church and society as voluntary associations. Medieval society had been characterised by familiarity; people achieved a level of freedom whereby they could do whatever they pleased without fear of violating the norms of the society***. In contrast, civil society would slowly, but surely, sever all the ties of familiarity, put egoism and selfish need in the place of familial ties, and dissolve the human world into one of atomistic individuals who are inimically opposed to one another. This is a process of severance that continues globally to this day. There had once been no division between the inner and personal life of religion and the practical interests of the external order. After the Reformation all national, natural, moral, and theoretical conditions would become extrinsic to man. Practical need and egoism began to replace salvation as the motivating force of society and, as such, would eventually appear in purest form as soon as civil society had fully given birth to the political states of Europe and North America. Undoubtedly, in the new monotheism following the Reformation, money was and remains the god of practical need and self-interest. The rending of the inner life from the external material world continues to this day, as the dominant economies,with their liberal ideology, countenance no resistance to the imposition of civil society and the worship of money worldwide. The Medieval individual was once part of an order of faith that stretched from the parish church and manor, to kingship, the Holy Roman Empire and Christendom. After the Reformation man’s supreme relation became the legal one. His relation to laws became valid for him not because they were the familiar laws of his own will and nature, but because they were the dominant laws and because departure from them was avenged. There had been no place in Christian medieval life for any economic activity which was unrelated to a sacred end. It is important to understand the holistic nature of this world view, for it was the totality of traditional society that distinguished it from the post-Reformation world, in which work came to be accepted as a practical necessity****,a view that would eventually fragment tradition’s authority. In fact, fragmentation could be said to be the hallmark of the new paideuma. Luther did not live to see anything even approximating to the full fruition of the social change wrought by the Reformation his actions had triggered.He was aware, however, of the direction of travel and, as can be seen in his later writings, it left him in despair. Having vented his anger against the sale of indulgences by the Catholic Church, he lived to see the forces of the Reformation leading to the very acceptance of the usurious practices, of Fugger the Rich and others, that he had warned must be kept in check. Society had turned in the very opposite direction to that which he had intended in his criticism of the Church’s financial malpractices and later pleas to the Christian nobility to keep usury in check. The banking culture emanating from commercial centres such as Antwerp could not be associated solely with the Jews. After all, the Pope’s banker, Fugger, the most successful banker of his day, was a Catholic. However, the myriad of accusations that Luther levelled against the Jews, most notably in On the Jews and Their Lies,demonstrate that he associated the lending of money for interest with a Judaic frame of mind, the influence of which had long since broken freeof the restrictions laid down by the Councils of Lyons (1274) and Vienne (1312). Many commentators have attempted to separate these railings of the older Luther from the young reforming radical on the cathedral steps of Wittenberg. However, Luther’s contempt for usury was consistent throughout his life. The harshness of tone in his old age simply reflected the increased despair at the pace of the revolution in social attitudes that was taking place before his very eyes. In his sermons, Luther preached against covenantal Christianity, advocating instead the theology of the cross. He must have seen, however, that a return to the Law was taking hold in early post-Reformation Europe and he would have interpreted this movement with dread. He new that in the early days of the church the unbelieving mind had interpreted the cross as nonsense — a religion founded on the crushing, filthy death of a man cursed by God was foolishness to Greeks and an offence to Jews, depending on whether theirs in was intellectual arrogance or moral self-righteousness. In the theological turn taken, soon to be full-blown Calvinism, he could see the same rejection of the cross and cycle of sin repeated. As Luther saw it, the living Word of God in Christ ceased to be a restraint upon economic self-interest. The Law of the Old Testament had instead become allied with the self-righteous economic virtues of the age as a reason why self-interest should be given free play, an attitude that would later be systematised economically by Adam Smith and philosophically by John Locke. 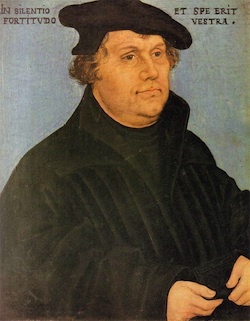 The same values that led Luther to condemn the financial chicanery of Leo X were those that left him exasperated at the new paideuma or, as Luther would understand it, the Judaic paiduema that was now taking hold. **A term coined by Leo Frobenius and described by Ezra Pound as meaning ‘the tangle or complex of the inrooted ideas of any period. . . , the gristly roots of ideas that are in action’. ***Click on Thought Pieces and see ‘Our wills become one single will’. ****Art resists this notion of work. The post-Reformation and Renaissance erassaw the rise of the artist who signed his work, who expressed himself, the artist often as rebel and outsider.